"The second date of Glenn’s pretty extensive UK tour brought him to Holmfirth’s Picturedrome – a nice venue which is increasingly attracting name music acts. A very respectably sized crowd was in attendance tonight – all the more impressive as the previous night’s gig at Manchester was only around 20 miles away. The Sabbath-like monster riff of Hughes-Thrall’s ‘Muscle and Blood’ kicks off proceedings and it’s heaviness is very much a statement of intent for tonight’s show : Glenn is clearly fully in rock-mode at the moment, riding the crest of the wave generated by the Black Country Communion launch. Fortunately the Hughes voice was more than a match for the challenging material on offer – the man just seems to get better and better – he was in a great mood too, clearly ‘high on life’ these days. I must admit that I groaned inwardly as a flurry of notes from new guitarist Soren Andersen preceded what I was sure would be another lengthy ‘Mistreated’ (nothing really wrong with that, it’s just that I’ve been seeing Glenn perform it on each tour for the past 7 or 8 years) – happily for me, it was a strutting ‘Sail Away’ which swaggered forth instead. Highlights of the show were…well, all of it really! The Trapeze songs were great – especially ‘Keepin’ Time’ – and it was nice to see ‘Addiction’ return for the first encore too. A lengthy vocal work-out at the end of ‘Don’t Let me Bleed’ showed the awesome range of the GH voice box whilst ‘Steppin’ On’ showed Glenn still has time for a little funkiness. The new drummer Pontus Engborg may look about 12 years old (or is that a sign of my getting old? ), but he plays like a monster and, just seemed happy to be there. Whilst guitarist Andersen’s posing maybe veered a little close to parody at times, the backstage footage of him on the internet suggests that maybe he really is like that all the time! A sprightly ‘Burn’ finished things off, and despite being a staple of Hughes shows since 94, but with both the guitarist and keyboard player Anders Olinder nailing the solos, it still had many a head (including mine) bobbing along in unison." "Managed to get near the front to spot Glenn had some interesting 'Axis Bold as Love' type of artwork covers draped on his two Laney bass stacks. Beginning with 'Muscle and Blood', drummer Pontus Engborg was grimacing as if in physical pain as he thrashed his way through the opener. Soren Andersen on guitar (with fingernails in black, very retro glam 70s) threw rock star shapes aplenty. This was in contrast to a restrained Anders Olinder on keyboards. It took a while to actually hear the keyboard playing through the mix. As Glenn put it early on, this was a rock and roll show and the energy was ceratinly there. For Glenn's bass technique spotters (like me) it was interesting that he often goes in for a bit of finger vibrato like a guitar player when adding some fills. Things stayed lively and it was a great treat to hear 'Sail Away' which reminded me how much I liked Burn on my first hearing. Glenn tried singing in the lower register on Coverdale's bits in the song (as David C might say!) transfering to his natural range on his bits. A good storming 'Medusa' which had some madmen (like me) in the audience singing along with it. 'Don't let me Bleed' was a Glenn Hughes vocal showcase and it was highly impressive with the quiet vocal improv interpolating (Made in Europe ref here!) with the loud bits Another suprise was that they played the Trapeze number 'Keepin Time' which allowed a brief (and funky) drum solo plus a Hughes funkmeister bass solo. 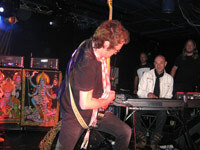 If you can, go and see Glenn Hughes on this tour as it should liven up your Autumn a treat. If Mark III can't reform this will more than make up for it!" "Unfortunately the venue was only about one third full. That said I wasn’t complaining as I got an excellent view close up to the stage, without being “elbowed etc”. Highlight for me was “Don’t Let Me Bleed”. How the hell Glenn can still multi-octave amazes me. That and the constant movement around the stage. Made me feel really unfit! I went with friends from work who were all blown away by the show. One guy had last seen Glenn at the Wembley arena on the ill-fated MK IV tour. So he wasn’t prepared for what we got. We also included one lad who is 20, he was staggered at how good things were. The band all looked like they were having fun. Special mention for the drummer. He was good. At one point in his drum solo he was hitting the kit so hard the snare drum was wobbling, I really thought he might have it over at one point. Reminded of the late great Cozy in terms of his attack. As Glenn said “Now that’s a f***** drummer”. Full marks to Glenn and the band for being unfazed by the poor attendance (shame as the venue is excellent, I think Simon would appreciate the sound and architecture) and delivering. Bet a certain Man in Black would have decided as the crowd didn’t turn, nor would he? Looking forward to the Black Country Communion tour (which is now a defo for the guys who went with me and also those poor unfortunates from work who didn’t attend). Anyone who hasn’t yet seen Glenn on this tour, kill your mum for a ticket while you can, he’s on fire." "Glenn played the Spring and Airbrake, which is a small club venue more used to (God Help Us) dance music. It was a good, enthusiastic crowd of around 250 who welcomed the band on stage dead on nine o'clock. The set details are elsewhere so I won't bore anyone. Suffice to say that Glenn's vocals were top notch. The band comprising, via the wife, the Duracell Bunny (drums), Tommy Bolin and Reb Beach's lovechild (geetar) and Brain from Pinky and the Brain (keyboards) were very tight indeed. Glenn has lost none of his vocal range and the delivery was as powerful and soulful as ever. Given that this was his first visit to Belfast, coinciding with Deep Purple's first visit earlier in the year, it's been a good year for Purple fans in Norn Irn.